Written by one of the world's pre-eminent historians of the Holocaust, this elaborately illustrated edition paints a personal and social portrait of one of history's greatest tragedies. Enormously informative, respectfully presented, and cogently arranged. The almost unbelievable story of the Holocaust, told by the authoritative Martin Gilbert, is augmented by firsthand accounts and poignant illustrations. Owing much to "those who have assembled the basic Documentation,", his text is easy to follow and matter-of-fact, allowing the horror of the events to speak for itself. 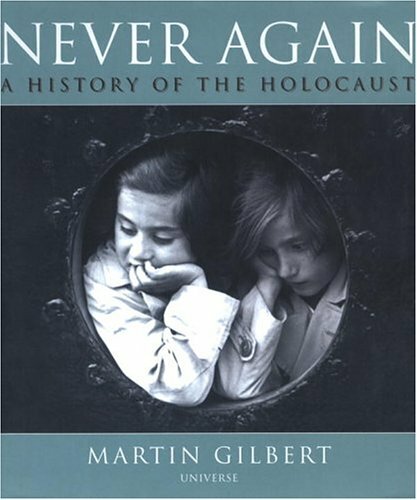 Gilbert's chronological narrative captures, in a tragically compelling way, the dark progress of the gathering evil--from a background of "century after century" of anti-Semitic persecution to the Nuremberg Laws and the death camps. Never Again powerfully counteracts the dehumanizing nature of Nazi extermination. As the statistics "represent real people," names are put to faces in photographs and the stories of individuals (some now household names) are told. Ending with coverage of survivors' postwar lives and the war crimes trials, which have continued practically into the new century, the book gives past events a closer reality. Peppered with "acts of individual and collective bravery," Never Again is also a reminder that hope was never extinguished.